+ I love having a good audiobook to listen to here and there throughout the day, and the one I'm currently listening to is fantastic. It's called A Sliver of Light: Three Americans Imprisoned in Iran. It's much longer than I'd anticipated, but the story is riveting and I'm always a sucker for a good memoir. As always, I'm listening to this through the Overdrive app, which connects to my local library (so I'm able to listen to audiobooks for free). + I recently realized my favorite maternity dress totally works as a non-maternity dress, and for that I am grateful. It's kind of amazing when something can look great on someone 39 weeks pregnant, and then still look great (and non-maternity-ish) on someone nearly one year postpartum. (Bonus points for the fact that I can houdini myself out of the sleeves in order to breastfeed Cora, even though it's clearly not a nursing-friendly design.) Target does it again! + Netflix just informed me via email that a new season of Grey's Anatomy is available and I'm all over that business. Granted, I have no idea when I'll be able to get through all the episodes (binge-watching is a wee bit different when you have two children, one being a wild little non-sleeper at night). But, still. There are few shows that I enjoy watching, and Grey's continues to be one of them—even if I never watch it live and always wait until the entire season is available to stream. + A sweet friend recently brought me flowers after I babysat one of her daughters and oh, the joy of a bouquet of flowers! I honestly can't even remember the last time I had fresh flowers on our table. It makes me want to start indulging in a bouquet for myself, even if it's just once a month. Perhaps I shall. Trader Joe's flowers are my weakness! Such a sweet, cheap treat! And friend, Grey's Anatomy will always have me watching... I just cannot stop, no matter how much I disagree with the producers character decisions! Getting fresh flowers is the most wonderful thing! I try to buy some for myself whenever I hit up Trader Joe's. For $5, it's such a small & manageable joy. I am so over this heat wave already. Also I just can't quit Grey's either. It's so good, but so bad, but still so good. 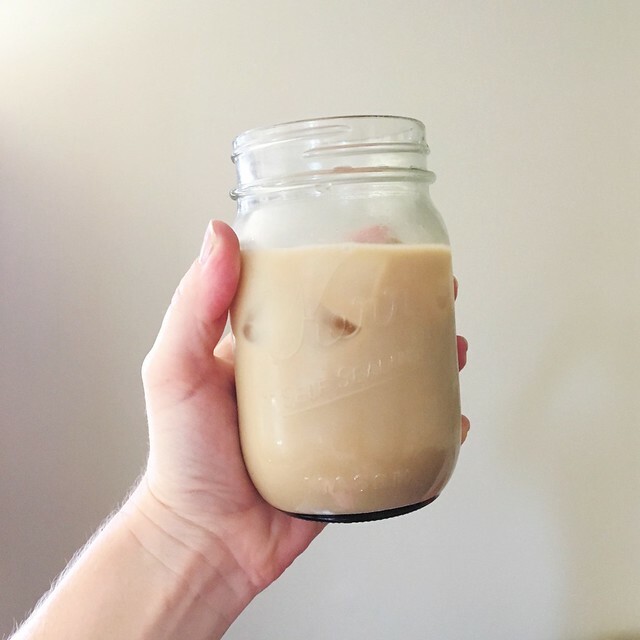 cold brew is my saving grace in the summer.